Home » Team » Diane Jongert, D.V.M. I pursued the dream of medicine (be it human or veterinary), since high school. I decided that it was going to be veterinary medicine while completing my Bachelor of Science from the University of Western Ontario in 1997. 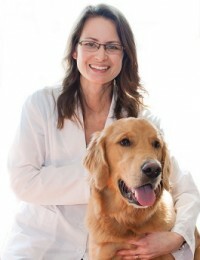 I graduated in 2004 with a degree in Veterinary Medicine from the Ontario Veterinary College in Guelph and have been working at Stoneybrook Animal Hospital since June 2004. Day-to-day, at Stoneybrook Animal Hospital, I meet many wonderful clients and their many different pets. I enjoy being able to utilize my medical and surgical knowledge and training to make a positive difference in the lives of our companion animals. Many aspects of veterinary medicine appeal to me, but I have a special love for our canine friends – at every stage of their life. My husband, Geert, is a large animal veterinarian. We have two children, Emily and Brendan and are kept busy with our loving Golden Retriever, “Sonny”, two cats, “Smudge” and “Miles” and four pet chickens!